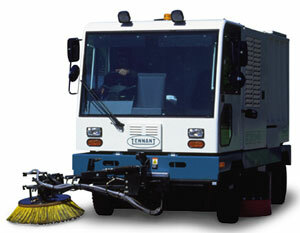 The highly maneuverable Tennant 830II sweeper clean-sweeps dirt and debris from narrow city streets and alleys. The highly maneuverable Tennant 830II sweeper clean-sweeps dirt and debris from narrow city streets and alleys. Unlike competitive models, its high-efficiency filtration system serves as a dust trap - eliminating annoying and hazardous dust clouds. Tennant Company, P.O. Box 1452, Minneapolis, MN U.S.A. 55440. Call toll free: 888-727-8237. In Quebec call: 514-335-6061. Fax: 612-540-1437.